Well it’s now October, the traditional month to start brewing again. (Traditional German Brewing Season is October to March) I’m pretty confident that I will be doing my first real batch of home brew this month. 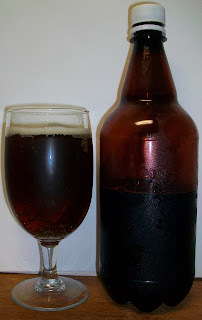 But before I do I thought I would recap and post reviews of the Mr. Beer home brew that my son John and did back in August 2010. We had a blast with this Mr. Beer Home Brew. I had this kit for several years (like 10) and never used it. We finally bought a new ingredients kit and gave it a whirl. We did notice a big mistake when finished. The new kit new kit came with a booster pack what we did not use. My old instruction did not mention the booster pack but suggested to add more table sugar to boost the ABV. The following is three separate reviews or tastings of this home brew. The beer pours a nice amber color with copper hues and a modest white head. The head diminished to just a ring around the top of the beer in just a few minutes. The nose has sweet toasted malt aromas and some light floral hops. There is also an interested sweetness and yeasty notes. This is odd, it’s just not right. It is missing something and there is an odd tang or tinge to it. I suspect that this is just too young and needs to set for at least another week or two. It smells better than it taste, that’s for sure. I don’t think I’m going to do the normal play by play. This is going to be more of a taste test for quality control. It’s not bad. As my son John just said we have spent money on much worse and he is right on that. For a first time home brew it is very much a drinkable beer. But I can’t say it is a good beer. There is an odd harshness and tang in the back end and finish. This is also accompanied by a yeasty note was well. I assume that this is because the bottle conditioning is not complete yet and this should go at least another week. There is also little to no malt flavor in this beer. Again this may be remedied by a little aging. On a more positive note; the color and nose is really nice. So for now two out of three ain’t bad. I’ll have to revisit this next week. The nose is still nice with sweet caramel malts and floral hops. Also the color has not changed. So like the first tasting it looks good and smells good. So let’s see if the taste improved any. Not bad. The flavors are still a little light for an English Brown but than again I really can’t compare this to anything else. This is actually a very refreshing beer. The taste starts out with sweet caramel malt up front but that only last for a split second. It is immediately replaced by effervescence and an almost tingling sensation over the tongue. This continues throughout the middle of the sip. The back end has a building harshness to it. This harshness carries through to the finish. The finish is fairly dry with very little of a final aftertaste. What is left is a slight light malt flavor. I guess this is drinkable but it’s not really enjoyable. The good news is that this is encouraging me to learn more and brew a better beer next time. We are more than a year since we brewed this beer back in August of 2010. This is the last bottle that I have been cellaring in the beer cabinet. The nose is modest but pleasant with caramel malt aromas with light floral hops along with some grassy notes. Well, it’s probably the best tasting yet. It’s still very grassy with a green apple finish but highly drinkable. It starts out with a caramel malt sweetness up front then a tingling effervescence over the tongue during the middle of the sip. The back-end is very easy drinking with an almost effortless swallow. There is another carbonation release during the swallow. The finish is not too bad. There are nice malt flavor but some not so nice green apple flavors mixed in. There is not much of a final aftertaste just some lingering sweet caramel malts. All and all this is pretty drinkable; it has certainly gotten better over time. The more I drink this the more I like it. Don’t get me wrong it’s not that good but it is drinkable. There is a nice malt robustness now that I did not notice on the previous (younger) tastings. The beer now looks and tastes like an English Brown. I’ll have to look back at other pictures but his seems a little darker also. I’m letting this warm up a little and it’s staying pretty good. It is not picking up anything offensive anyway. The malt flavors are actually nice and the grassiness and green apple taste seems to be diminishing as it warms and opens up a little. I’m not going to give any of these a rating. 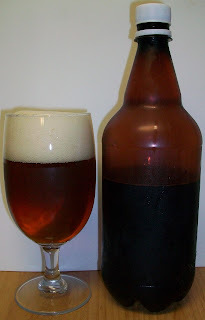 The one lesson learned here is that home brew gets better as it ages.